A day in a strange city with its own rules and rituals, including the ritual that marks Magda’s passage toward adulthood, all as described by her friend who won’t have his own Kite Day for a year or more. 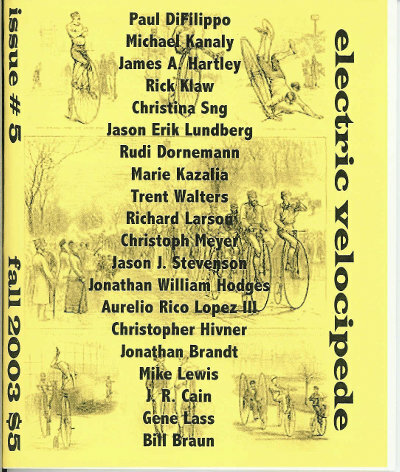 The story appeared in issue 5 of the print magazine Electric Velocipede. Back in 1995, it appeared in Shadowdance, a magazine that isn’t around any longer. It’s set in the same world– same city, even– as both “Sunfast” and the novel I’ve been working on for the past couple years. From the hour of the chase through the hour of the triple queen, I tended the shadow garden. I directed the visitors. I explained the hard to see parts. I kept the children on the paths and out of the mirrors. Between these shepherdings, I pruned and tucked the wild edges, mulched the echoweed and forged a few entries in the guestbook. The hour of the kingdom seemed forever in coming. Later, I changed. Osier found me and we talked of the day, of Magda, the kite, the morning’s crowd on the common, and the evening’s. He had been trying to understand what he’d written the night before. I’d been there, I’d watched while the muse rode him and I’d felt the frenzy like a storm charge in the air, but I couldn’t help him. I had iced and reasoned; I was not the same.